We calculate the risk of each individual asset in our portfolio to ensure we know exactly how it is behaving. We analyze prices to determine movements and calculate statistics, such as correlation and volatility, that help us construct our risk value. If risk is unknown, it cannot be managed. We are able to effectively manage risk by being able to quantify it. We use the power of today's computers to calculate the optimal amount of capital needed to achieve a specific risk target for each asset. The optimizer evaluates each asset in the portfolio and determines whether or not it is contributing the right amount of risk to the overall portfolio. We invest the assets in the portfolio according to the capital amounts calculated during our optimization. 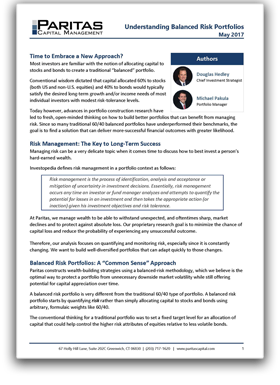 A balanced risk management approach – avoiding large drawdowns – ultimately delivers long-term outperformance and superior risk adjusted returns. Lower risk doesn’t mean settling for lower returns. There is a time to play defense and a time to play offense. We use risk to evaluate when markets provide an opportunity for growth or when protection is required. When the environment is favorable, we adjust portfolio allocations to capitalize and grow wealth. Our adaptive portfolio management process allows for action in times of extreme market volatility. The Global Wealth Strategy portfolio experienced 52% less of a drawdown than the S&P 500 Total Return Index, helping to reduce fear while keeping clients on track and invested. Source: FactSet. 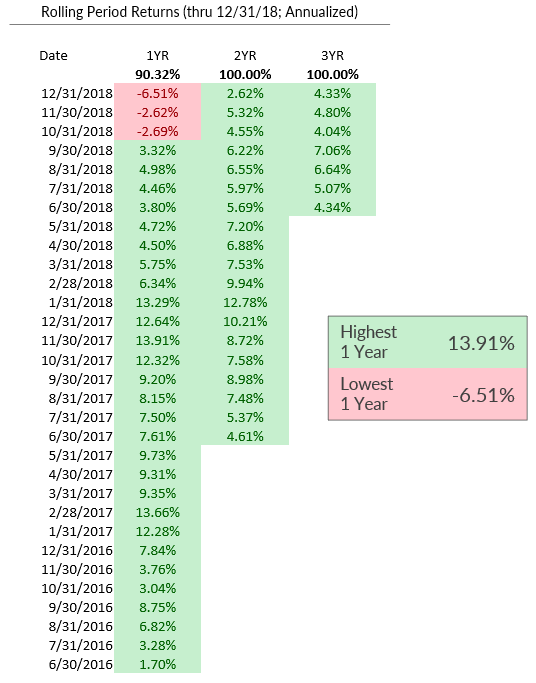 The historical performance of the index cited is provided to illustrate market trends. It is not possible to invest directly in an index. Index performance does not take into account fees and expenses. Past performance is no guarantee of future results. GWS performance is net of fees. A pro forma 0.60% management fee was applied to the gross performance of the GWS simulation to arrive at net performance. GWS has produced consistently positive absolute returns over different rolling time periods; which can give clients peace of mind. Its consistency helps achieve competitive returns in a low yield environment while minimizing volatility. By utilizing a disciplined investment process, GWS adapts to changing market conditions which helps to protect against last drawdowns and allows investors to remain in the markets without fear or panic. This type of smoothed return stream can help to ease retirement concerns. We believe that lower risk does not have to mean lower return. A smoother investment experience increases the potential for higher long-term risk-adjusted returns by continually compounding at a more consistent rate. As of December 31, 2018. Source: FactSet. GWS performance is net of fees. A pro forma 0.60% management fee was applied to the gross performance of GWS to arrive at net performance. Past performance is no guarantee of future results. We construct a globally diversified portfolio that is invested across asset classes and segments. Risk is balanced evenly among the four major asset classes. 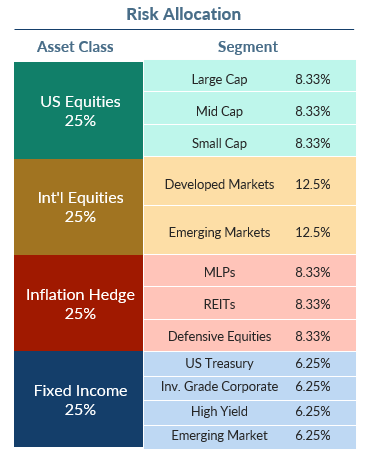 Asset classes are broken down into asset segments which are further equally divided. Capital is allocated to maintain a constant risk target, rather than static capital targets. 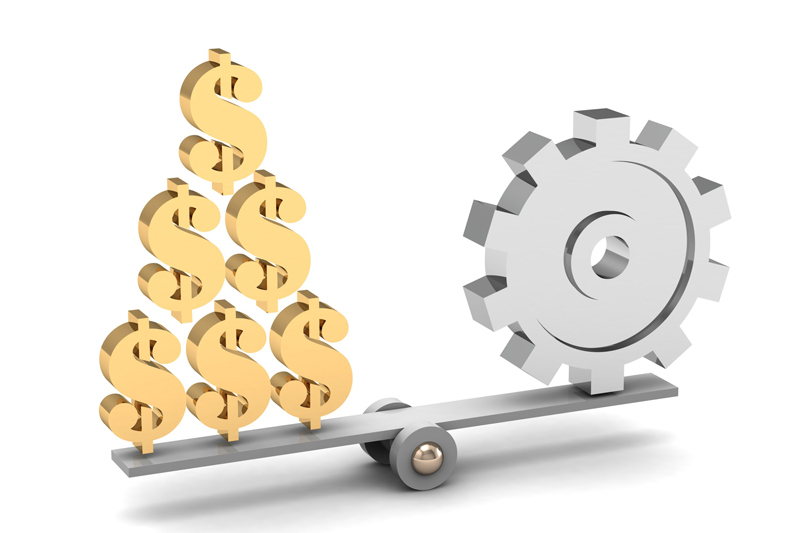 Asset allocation/diversification does not guarantee a profit or eliminate the risk of loss. Past performance is not a guarantee of future results. Portfolio wealth must be managed to withstand unexpected market shocks. Therefore, risk must be managed effectively through careful analysis and quantification. We define risk as the probability of a negative outcome. Traditionally, investors have attempted to predict the unpredictable and focused on forecasting events and results. We analyze market data to construct optimized portfolios for the current risk environment. 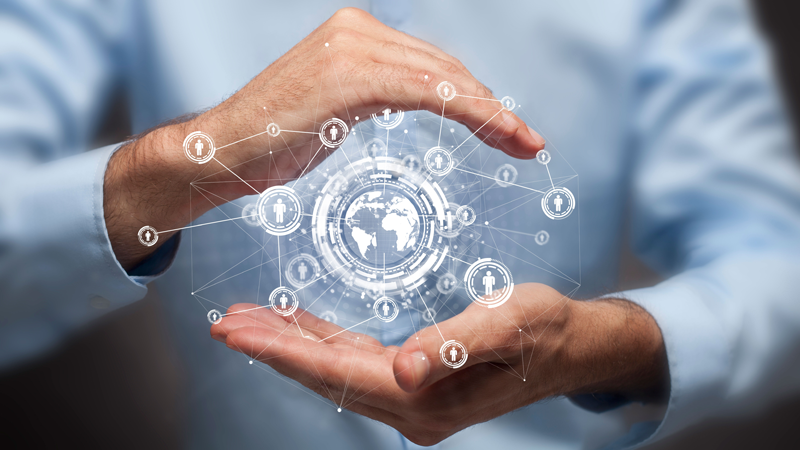 The success of the Global Wealth Strategy is a function of our ability to reallocate capital in line with our proprietary research on market risk. We monitor our portfolios to ensure that the risk targets have been met and that each account is optimized for the current market environment. Our trading process is tax-aware; our goal is to provide investors with high after-tax returns. 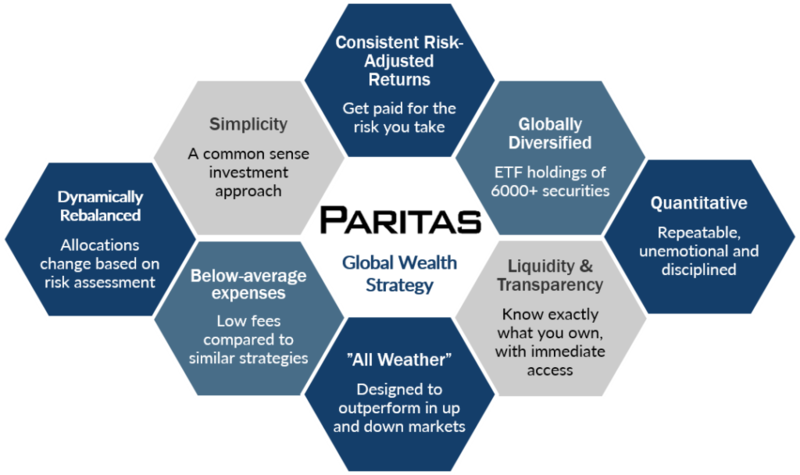 We’ve diligently researched how to construct a global balanced risk portfolio with an active top-down strategy combined with highly-liquid passive ETF investments. GWS invests in “best fit” asset class indices. The portfolio has minimal overlap in its holdings, unlike the composition of many peer group competitors. Every ETF holding is scrutinized for quality and cost. The GWS “all weather” portfolio is a solid long-term core holding for most risk-averse investors.